Spinal stenosis nerve pain is really the only type of discomfort which can be experienced due to a narrowed central or foraminal canal. It should be noted right from the start of this article that all symptoms experienced directly from any type of stenosis will always be considered neurological in nature. The fact that a neuroforaminal opening or central canal becomes narrowed will never produce any pain or related symptoms if the nerves are not influenced in a negative way. Therefore, nerve pain is inherent to symptomatic forms of stenosis, since this is the only manner in which a narrowed canal can enact symptoms. That all being said, it must also be made clear that not every patient with symptomatic versions of stenosis will suffer pain. In fact, many might have terrible and disabling expressions, yet have only minor pain or no pain at all. Therefore, it is worth noting that while a diversity of neurological symptoms can result, pain is only one of these possible consequences when nerve tissues are affected. This article will explore nerve pain and how stenotic changes might generate this type of symptomatic expression through various processes. Stenosis-related nerve pain is defined simply as discomfort of an acute or chronic variety which is generated by the interactions of stenotic changes and sensitive spinal neurological tissues. In essence, the stenosis itself is not painful, but when it affects the nerves, pain may be one possible resulting effect. Pain in stenosis patients ranges greatly from none to debilitating. This can be true for both major types of stenosis, including central and foraminal varieties. 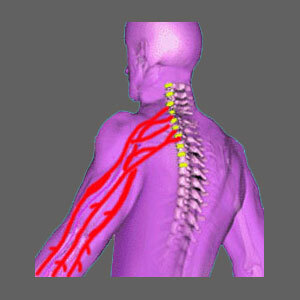 However, statistics show that most cases of foraminal stenosis should not become chronically painful, since a pinched nerve should stop signaling with time and end up in a condition of objective numbness and correlating weakness in the area of the body served by the compressed tissue. Meanwhile, stenosis in the central canal may affect the spinal cord or cauda equina and has a greater chance of causing pain which may endure until resolved through targeted treatment. Since some patients do not have pain at all, they might put off going to see a physician about less concerning symptoms, such as weakness, numbness or tingling. This is never prudent, since these symptoms might indicate even worse degrees of stenosis in some patients than conditions which do generate pain. Of course, no one wants to have pain, but remember that this nerve impulse is an anatomical warning that something is not right. When a person suffers pain, at least they have a good idea that there is some cause which needs to be addressed. To prove this point, stenosis patients are 85% more likely to seek diagnosis and treatment earlier if they do have significant pain, than if they do not. This is true regardless of the severity of the stenotic changes involved in each individual case. Spinal stenosis is never a cookie-cutter disorder in its symptoms, causes or consequences. Every case is truly individualized in many regards. It should be mentioned that pain is likely to occur in cases of pinched nerves, and with severe central stenosis, but that this is not an absolute rule. Many patients actually suffer complete neurological dysfunction slowly, or suddenly, with such effects as foot drop, incontinence or the inability to stand being present. However, they do not have, nor have they ever had, any noticeable back or neck pain symptoms. When it comes to nerves, the effects of any compressive process can be estimated and evaluated, but doctors still get surprised by exceptions to the seeming rules rather often. The best way to inform patients of the seriousness of spinal stenosis is to educate them that pain may or may not be present, but this does not indicate a more or less significant expression. Instead, patients must report all atypical symptoms to their neurologists, regardless of whether they have pain or not. This is the best way to achieve an accurate diagnosis and enjoy effectual therapy before the stenosis escalates.